The 412th Test Wing held a technical symposium at the Airman and Family Readiness Center June 5, 2017. The event was intended to give engineers and scientists a broader view of the different test programs at Edwards Air Force Base, Calif. Leaders often say the number one asset for the U.S. military is people. 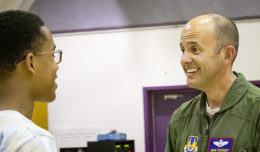 The engineers and scientists who help put the world’s most advanced weapons and aircraft into the air for the world’s most powerful military ensure that the 412th Test Wing at Edwards Air Force, Calif., is no different. 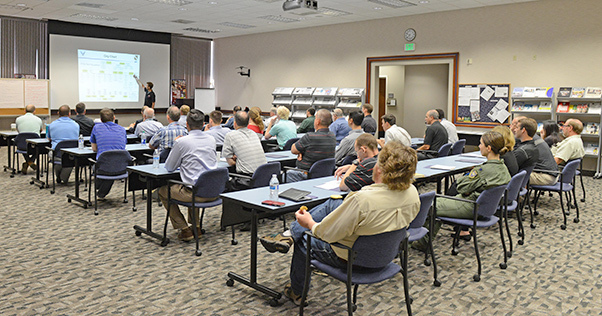 These scientist and engineers gathered for a meeting of the minds – a technical symposium — June 5 at the Airman and Family Readiness Center here. The technical symposium was the brainchild of Ann Harris who is the technical assistant to David Wheaton, 412th TW senior technical director. It was promoted as an opportunity for science and engineering professionals on base to learn about the different test programs being conducted outside their own units and given professional insight into the future of testing. “Sometimes it can be hard to feel that what you do is important and matters. This was also a way to celebrate the huge contribution that the engineering workforce makes to the mission of the test center. We write the test plans, we monitor the missions and we write the reports. But we rarely get to see what other combined test forces are doing, or what other disciplines do. This was a step in rectifying that situation,” Harris said. Presentations were given from various technical experts, test pilots, the innovation team, the statistics branch and a number of engineers who talked about test projects they’re working on such as high-altitude airdrop, Auto Ground Collision Avoidance, emerging technologies, weapons testing, sensors and weather radar data analysis. Non-technical lectures were also given on leadership and career development. 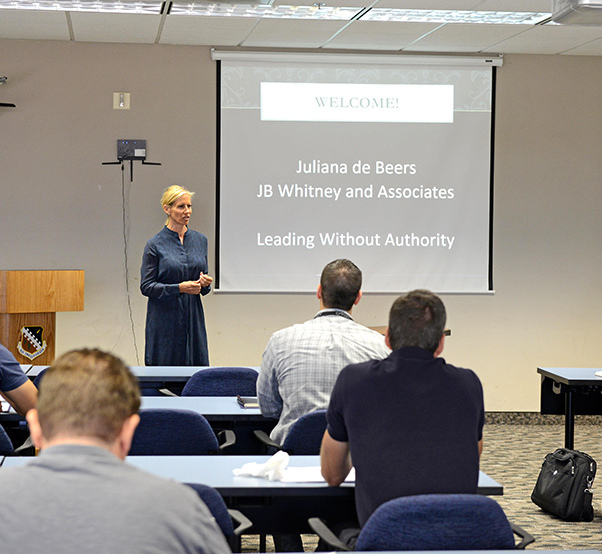 Juliana de Beers of J.B. Whitney and Associates, a company that specializes in training and career development, speaks at a technical symposium put on by the 412th Test Wing June 5, 2017. Some non-technical presenters were available to discuss career development and workplace improvement. Harris said about 150 people attended the local seminar and the event was a success due to the support of all the presenters who took time out of their schedules to come, most for the entire day. 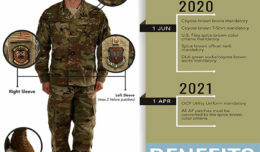 Harris was also assisted by Lt. Col. Ivan Acosta, 412th TW deputy technical director, and the 412th TW executive staff. Harris added the test wing hopes to conduct more symposiums in the future.